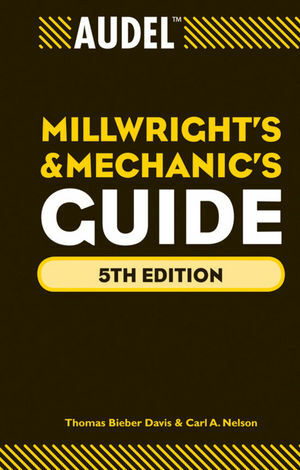 Respected by generations of skilled workers, Audel Millwright's and Mechanic's Guide is the only trade manual to cover maintenance and troubleshooting for all the mechanical trades in a single volume. Now available in hardcover, it covers the newest equipment on shop floors as well as older machinery, sometimes more than 30 years old, for which little maintenance and repair information remains available. Millwrights, mechanics, machinists, carpenters, pipe fitters, electricians, engineers, and those who supervise them will find this book invaluable. This hardcover edition of Audel Millwright's and Mechanic's Guide is as valuable to today's skilled workers as previous editions were to their fathers and grandfathers. Thomas Bieber Davis is a mechanical engineer and trainer in preventive and predictive maintenance at all levels. He has also developed preventive maintenance products for industrial use. Carl A. Nelson wrote numerous practical manuals for the mechanical trades, including earlier editions of this book, before his death in 1993.